Watch your movies then eat them with this cookbook featuring more than 40 dishes seen in iconic films. It's quiz time, movie buffs. What pie does an unfortunately nicknamed character eat at the pie eating contest in Stand By Me? 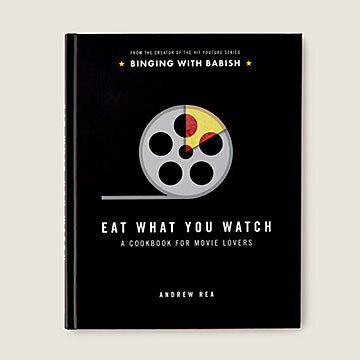 Take movie night to the next level with this one-of-a-kind cookbook that lets you eat what you watch. It has 41 recipes for dishes seen on the big screen. Think: hazelnut gelato from Roman Holiday and double-decker New York style pizza inspired by Saturday Night Fever. It makes a delightfully unexpected gift for movie lovers and foodies alike. Oh, and the answer: blueberry pie. Made in China. Great and lots of fun cookbook with a difference!